Copyright © 2002, 2004 International Business Machines, Inc.
but after a while, he knows something. The primary method for Eclipse plug-ins to be notified of changes to resources is by installing a resource change listener. These listeners are given after-the-fact notification of what projects, folders and files changed during the last resource changing operation. This provides a powerful mechanism for plug-ins to keep their domain state synchronized with the state of the underlying workspace. Since listeners are told exactly what resources changed (and how they changed), they can update their model incrementally, which ensures that the time taken by the update is proportional to the size of the change, not the size of the workspace. Listeners must implement the IResourceChangeListener interface, and are registered using the method addResourceChangeListener on IWorkspace. It is also important to remove your resource change listener when it is no longer needed, using IWorkspace.removeResourceChangeListener. During a resource change notification, the workspace is locked to prevent further modification while the notifications are happening. This is necessary to ensure that all listeners are notified of all workspace changes. Otherwise, a change made by one listener would have to be broadcast to all other listeners, easily creating the possibility of an infinite loop. There is a special exception to this rule for the PRE_BUILD and POST_BUILD event types that will be discussed later on. * in a subsequent resource change event. Every method in the resources API that contains such a phrase will trigger the broadcast of a resource change event to all listeners. The only exception is when the operation doesn't actually change anything in the workspace, for example if the operation fails or is canceled before any real changes occur. In this case no change events are broadcast. It is important to note that the broadcast does not necessarily occur immediately after the method completes. This is because a resource changing operation may be nested inside of another operation. In this case, notification only occurs after the top-level operation completes. For example, calling IFile.move may trigger calls to IFile.create to create the new file, and then IFile.delete to remove the old file. Since the creation and deletion operations are nested inside the move operation, there will only be one notification. Clients of the resources API are strongly encouraged to follow this nested operation behavior, also called batched changes, for their own high-level operations. This is achieved by wrapping the operation code inside an instance of IWorkspaceRunnable, and passing it to IWorkspace.run(IWorkspaceRunnable). Wrapping high-level operations inside an IWorkspaceRunnable can lead to a substantial performance improvement, because it ensures that only one resource change broadcast occurs, instead of potentially thousands. Below is an example of an operation that is nested using the IWorkspaceRunnable mechanism. In this case, a single resource change event will be broadcast, indicating that one project and ten files have been created. To keep it simple, progress monitoring and exception handling have been omitted from this example. Since Eclipse 3.0, it is no longer guaranteed that an IWorkspaceRunnable will prevent notifications for the entire duration of an operation. The workspace can now decide to perform notifications during an operation to ensure UI responsiveness. This is particularly important when several workspace modifying operations are running simultaneously. The use of IWorkspaceRunnable is still strongly encouraged, functioning as a strong hint to the workspace that a set of changes is occurring that can be batched. Also in Eclipse 3.0, a background equivant to IWorkspaceRunnable was introduced. WorkspaceJob will batch a set of workspace changes that occur inside a Job running in the background. Read the Concurrency infrastructure documentation for more details on jobs. A very powerful feature of the resource change infrastructure is that listeners will even be notified of changes that occur outside the workspace API. If some external editor or tool makes changes to resources in the workspace directly from the filesystem, resource change listeners will still receive the same notification describing exactly what changed and how they changed. The drawback is that since most operating systems don't have such a resource change mechanism of their own, the eclipse workspace may not "discover" the change until later on. Specifically, the workspace will not send the notification until someone performs a IResource.refreshLocal operation on a resource subtree that has changed in the filesystem. After the refreshLocal operation, the workspace will send resource change notification to all listeners, describing everything that has changed since the last local refresh. even from those who talk badly. The resource it corresponds to. The kind of modification (added, removed, or changed). The precise nature of the change (the change flags). A summary of what markers changed on the resource. Deltas for any added, removed, or changed children. In the case where a resource has moved, the delta for the destination also supplies the path it moved from, and the delta for the source supplies the path it moved to. This allows listeners to accurately track moved resources. Delete "Folder1", which causes deletion of "File1" as well. 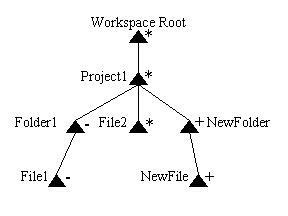 Modify the contents of "File2"
Create a folder called "NewFolder" inside "Project1"
Create a file called "NewFile" inside "NewFolder"
In this diagram, the symbol next to each resource delta represents the kind of modification, + for addition, - for removal, * for change. Note that all resources with affected children are marked as changed, and that unaffected resources (Project2), are not included in the tree. CONTENT IFile, IFolder The filesystem modification timestamp has changed since the last notification. IResource.touch() will also trigger a content change notification, even though the content may not have changed in the file system. ENCODING IFile, IFolder, IProject The character encoding for a file, or for the files inside a container, have changed. For listeners that care about the character content of the file, as opposed to the raw bytes, this should typically be treated the same as a content change. MOVED_FROM IFile, IFolder, IProject The resource was moved from another location. You can find out the path it came from by calling IResourceDelta.getMovedFromPath. MOVED_TO IFile, IFolder, IProject The resource was moved to another location. The location it was moved to is indicated by IResourceDelta.getMovedToPath. OPEN IProject The project has either been opened or closed. If the project is now open, then it was previously closed, and vice-versa. TYPE IFile, IFolder The resource has changed type. 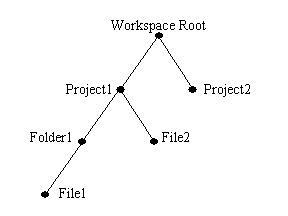 If the resource was previously a file then it is now a folder, and vice-versa. MARKERS All The resource's markers have changed. Markers are annotations to resources such as breakpoints, bookmarks, to-do items, etc. The method IResourceDelta.getMarkerDeltas() is used to find out exactly which markers have changed. REPLACED IFile, IFolder, IProject The resource has been replaced by a different resource at the same location (i.e., the resource has been deleted and then re-added). DESCRIPTION IProject The project description has changed. SYNC All The resource's synchronization information has changed. Sync info is used to determine if a resource is in sync with some remote server, and is not typically of interest to local tools. See the API interface ISynchronizer for more details. Earlier on we said that the principal type of event is the POST_CHANGE event. However, there are some circumstances where listening to other event types is necessary. You can register for particular event types using the API method IWorkspace.addResourceChangeListener(IResourceChangeListener, int), where the supplied integer is a bit-mask of all event types you want your listener to receive. The first category of special events are pre-change notifications. Since the POST_CHANGE event is broadcast after-the-fact, some valuable information that the listener needs may be missing. In these cases, use the PRE_CLOSE and PRE_DELETE events, broadcast before a project is closed or deleted. The project in question can be obtained from IResourceChangeEvent.getResource. There is no resource delta for these event types. These events allow listeners to do important cleanup work before a project is removed from memory. These events do not allow listeners to veto the impending operation. The other special event types are associated with the workspace build mechanism. Incremental project builders sometimes require special initialization code to be executed before all builds happen, and/or special post-processing after all builds are complete. For these reasons, there are PRE_BUILD and POST_BUILD event types. These events are similar to POST_CHANGE, as they also provide a resource delta tree describing what has changed since the start of the operation. These events are broadcast periodically even when autobuild is turned off. Since Eclipse 3.0, these build events no longer occur in the same thread that modified the workspace. Instead, they always occur in the same thread in which the actual build occurs. Since autobuild occurs in a background thread in Eclipse 3.0, so do the surrounding pre- and post-build events. Another special characteristic about these events is that listeners are allowed to modify resources during the notification. This feature should be used sparingly, however, as changing resources during the change event sequence will add extra overhead to every operation. Remember workspace state ( ). Notify POST_CHANGE listeners of all changes between and . Remember the state at the end of the last build operation ( ). Remember current workspace state ( ). Notify PRE_BUILD listeners of all changes between and . Notify POST_BUILD listeners of all changes between and . Close the circle by remembering the state at the end of this build operation ( ). It is important to note that the time intervals covered by the different event types are overlapping. It is generally not useful for a single listener to listen to more than one of these event types at once. Choose the event type that applies for your situation, and register for only that event type when adding your listener. If you do need to listen to more than one event type, keep in mind that the provided deltas will describe overlapping sets of changes. This is one of the reasons why POST_CHANGE is the most generally useful event type, because its delta will always describe all changes since the last POST_CHANGE event notification. PRE_BUILD and POST_BUILD events, on the other hand, will not always receive notification of every change. Listen to everything, forget much, correct little. Performance. Listeners should be lightweight and fast. Change notifications can occur quite frequently during typical use of the platform, so your listener must do its work in a timely fashion. This is not an appropriate place, for example, to be contacting servers or performing disk I/O. If you have expensive operations that can be triggered as a result of resource changes, consider posting the work to a background thread, or queuing the work until a time that is more convenient for your users. For example, the "Java Development Tools" (JDT) plug-ins provide a search engine that indexes Java source and JAR files to allow for more efficient searches. When these files change, the search engine must rebuild the indexes for these files. The JDT plug-ins use a resource change listener to collect the list of changed resources, and then posts that list to a background thread that rebuilds the indexes. In the interest of making resource change listeners faster, some convenience methods exist on IResourceDelta and IResourceChangeEvent that allow you to do your updates faster. If you are only interested in changes to a single resource (or a very small set of resources), you can use IResourceDelta.findMember(IPath) to quickly locate the resource you are interested in updating. The supplied path is considered as relative to the path of the resource delta that it is called on. Another common case is resource change listeners that are only interested in processing changes to markers ( IMarker objects). These listeners can use IResourceChangeEvent.findMarkerDeltas to quickly collect all changed markers of a given type. There is also a visitor mechanism (IResourceDelta.accept(IResourceDeltaVisitor)) for easily processing all changed resources in a given sub-tree. However, visitors should only be used where appropriate. Using a visitor to process two or three resources doesn't make sense, as the overhead of visiting the entire delta tree is incurred for no good reason. Since it's so easy to write a visitor, there is a tendency for programmers to use them too liberally, even in cases where they only want to process a well-defined subset of a tree. The return value from the visitor's visit method is used to indicate if that resource's children should be traversed. This can be used to short-circuit the traversal to avoid visiting sub-trees that you know you are not interested in. Thread safety. There are some multi-threading issues to keep in mind when writing listeners. First, you have no control over what thread your listener will run in. Workspace operations can occur in any thread, and resource change listeners will run in whatever thread that triggered the operation. So, if some of your update code must be run in a particular thread, you'll have to make sure your code gets posted to that thread. The most common example of this is UI updates. With the Standard Widget Toolkit (SWT), the UI toolkit that is included with Eclipse, there is only a single UI thread per display. If your resource change listener needs to update the UI, you will need to use the methods syncExec or asyncExec in class org.eclipse.swt.widgets.Display to post the update code to the UI thread. If any of your update code runs asynchronously (i.e., you used asyncExec or some similar mechanism to post your code to another thread), there is another consideration to keep in mind. The resource delta objects supplied to your listener are designed to "expire" when the resourceChanged method returns. So, if you pass references to IResourceDelta objects to another thread, they may cause failures if they are accessed after the listener method has returned back in the other thread. The reason for this resource delta "expiry date", is to ensure that listeners don't hold onto resource delta references indefinitely. These delta structures are potentially quite large, and if a listener holds onto them, it essentially causes a memory leak because these structures can no longer be garbage collected. Let's tie together everything we've learned so far with a working example. This example shows a resource change listener that listens for changes to text files in a particular project's documentation directory. The list of changed files is collected, and then an update is posted to a JFace TableViewer that contains an index of text files. The listener would normally process added and removed text files in a similar way, but for the sake of space we'll just deal with changed files here. Observe how the findMember convenience method is used to find the child delta for the documentation folder, and then a visitor is used to collect the changes in that sub-tree. It is safe to use asyncExec here, because we have already pulled the relevant information out of the resource deltas. You should always use the isDisposed check inside an asyncExec. Even if the table exists at the time the asyncExec is called, there may be another item in the event queue that will dispose the table before this event can be processed. When plug-in writers implement their first resource change listener, they often encounter a dilemma caused by Eclipse's lazy plug-in loading behavior. Since plug-in activation may occur well after the workspace has started up, there is no opportunity add a resource change listener when the workspace is first started. This causes a "blind spot" for listeners, because they cannot process changes that occur between the time of workspace creation and the time when their plug-in is activated. The solution to this problem is to take advantage of the save participant mechanism. Save participants implement the ISaveParticipant interface, and are installed using IWorkspace.addSaveParticipant. The main purpose of save participants is to allow plug-ins to save their important model state at the same time that the workspace saves its state. This ensures that the persisted workspace state stays synchronized with any domain model state that relies on it. Once a save participant is registered with the workspace, subsequent calls to addSaveParticipant will return an ISavedState object. By passing a resource change listener to ISavedState.processResourceChangeEvents, participants are given the opportunity to process the changes that have occurred since the last save occurred. This fills in the "blind spot" between workspace startup and activation of the plug-in that the listener belongs to. To find out about other facilities provided by the save participant mechanism, read the API Javadoc for ISaveParticipant, ISavedState, and ISaveContext. Builders are always allowed to modify the workspace. Builders have support for progress monitoring, cancellation, and error reporting. Listeners operate on the entire workspace; builders are installed on a per-project basis. Builders are run in a concrete order that can be specified individually on each project. Builders can enforce dependency relationships with other builders (my builder must run after the "Foo" builder). Projects are also built in a specified order. With resource change listeners, there is no way to ensure or even discover the order in which listeners receive the change events. There are different build policies: incremental build, full build, and auto-build. Builder lifecycle and persistence is managed by the platform. Once a builder is installed on a project, it will remain on that project across sessions. Builder configurations can easily be shared with other users, since the information is contained in the shareable project description file (called ".project"). These differences aside, the principle behind project builders and resource change listeners is the same. Builders are provided with a similar IResourceDelta hierarchy that describes what has changed since the last time that builder was called. This gives builders a chance to incrementally update the resources they operate on in response to changes made by others. For more details on builders, see the eclipse.org article Project Natures and Builders. The Eclipse workspace provides a powerful suite of tools to allow plug-ins to keep notified and up to date when resources change. By installing a resource change listener, plug-ins are incrementally notified after any set of changes to the workspace, and are supplied with a resource delta tree that describes all the changes that have happened. Resource change listeners can also be notified when projects are about to be deleted or closed, or before and after auto-builds happen. The save participant mechanism can be used for notification about what happened before your plug-in was activated. The builder framework, discussed in more detail in another article, provides a more powerful mechanism for processing changed resources in a project.